Cost for such a recovery with software is typically $150. We have in the past sent some hard drives to www.payam.com.au in Sydney for major recoveries like that where the drive must be disassembled but you are looking at $500+. Data recovery can be a specialized process that should only be entrusted to people with the correct experience and resources. We provide simple software based recovery solutions and we do not take responsibility for your data nor guarantee it’s availability. If you have lost vitally important business information then we may refer you to a sophisticated lab like payam for precise dis-assembly and recovery of your drive. Losing your valuable documents, photos or business data can be a disaster. If something goes wrong with your computer’s storage device you could be facing just that. 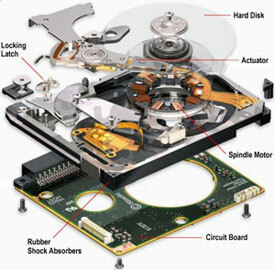 While computer storage devices such as hard disk drives, flash memory and usb keys are reliable they are not infallible and can still encounter problems that can result in partial or even total loss of data. Have multiple backups, use a web service like Dropbox. Always have your stuff when you need it with Dropbox. Sign up for free! Really I am amazed when people have vitally important files that they work on all the time and yet they have no backup. Especially considering that for many people a free 2GB of space is sufficient to cover the essentials, and you can have your stuff when you need it with @Dropbox, its like a usb stick in the cloud. You can sign up for free, I would have thought everyone would know about this by now but anyway, go here http://db.tt/T5H83arx – it is so easy to use and will save you from costly file recovery when a virus hits or your hard drive dies. I would guess we get a case like this in the workshop about once a week. If you use this referral link you will get a bonus 500mb of data, so you in fact will get 2.5gb of space. Have you accidentally deleted files? Don’t do anything! Switch off your computer immediately to avoid overwriting those files and losing them forever. We may be able to copy them to an External Hard Drive.